BANYAN has decelerated significantly. 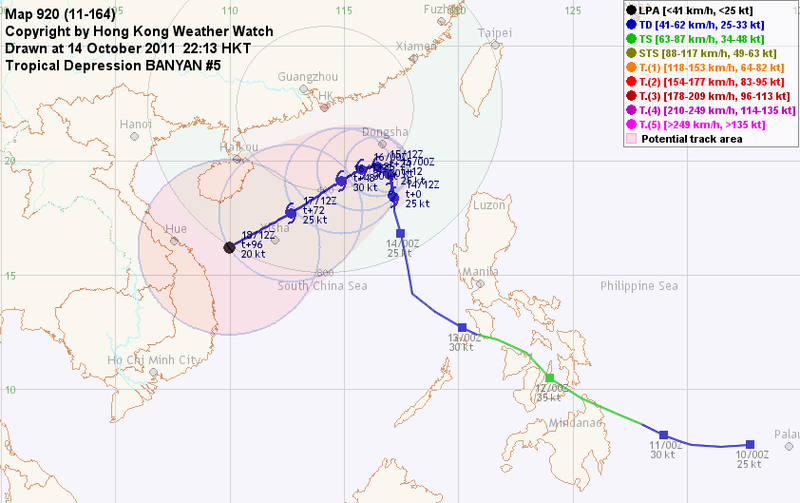 At 20 HKT, BANYAN was centred about 500 km (270 NM) SE of Hong Kong. BANYAN is the 130th name in the tropical cyclone name list. It was contributed by Hong Kong. This name was last used in 2005. BANYAN is expected to be slow moving in a generally weak steering environment. BANYAN's low-level circulation is fully exposed and lacks organization. The storm is expected to dissipate over water soon. This is the final bulletin on BANYAN. BANYAN moved north in the past 24 hours. 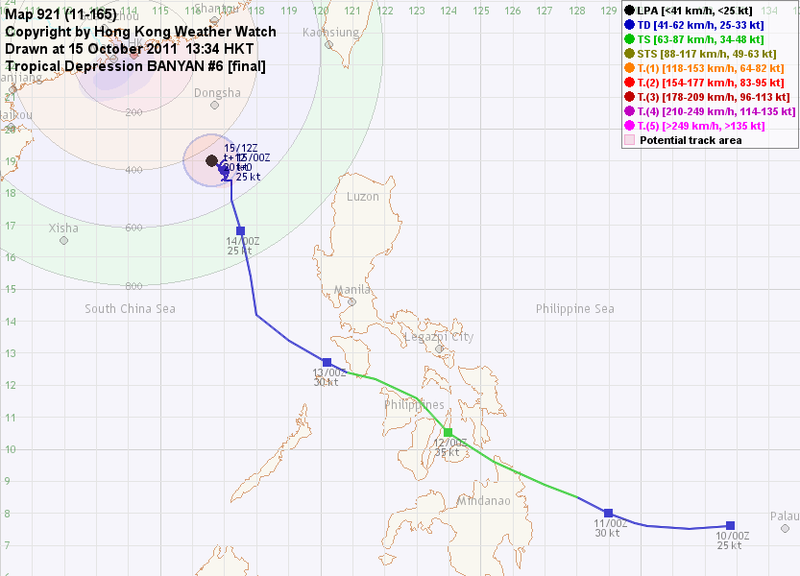 At 20 HKT, BANYAN was centred about 540 km (290 NM) SE of Hong Kong. The subtropical ridge has re-oriented, allowing BANYAN to move N in the past 24 hours. Steering is expected to diminish in the next 12 to 24 hours and BANYAN will remain quasi-stationary. A ridge will build in southern China. Together with the oncoming northeast monsoon, BANYAN should turn SW later on. BANYAN has lost most of its deep convections and it is difficult to locate its centre even with the help of WINDSAT wind field image. The storm might be able to strengthen slightly in decent sea temperatures and low to moderate shear, but later on it will move to a cooler area that will weaken the system. Dissipation over water is possible. BANYAN may enhance the northeast monsoon that is expected to arrive in the next 24 to 48 hours by increasing the pressure gradient. As BANYAN remains weaker than expected, the Observatory may consider issuing the Strong Monsoon Signal later when the monsoon arrives. BANYAN has weakened slightly. 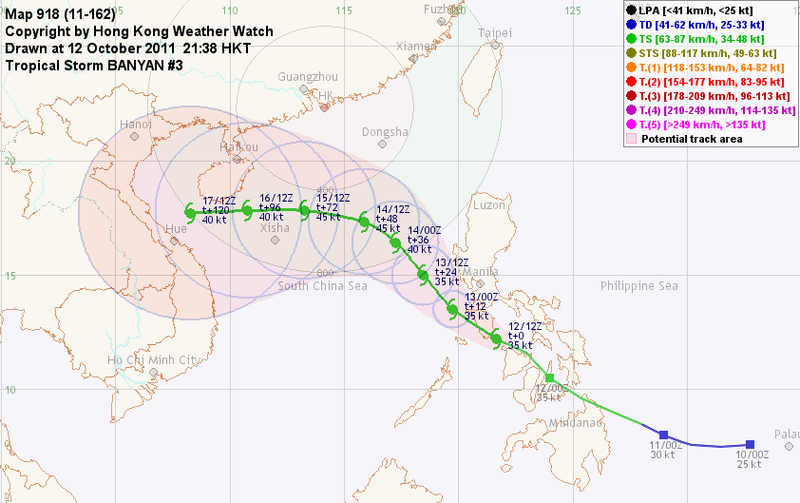 At 20 HKT, BANYAN was centred about 320 km (180 NM) W of Manila. BANYAN is travelling NW in the southwestern periphery of the subtropical ridge. It is expected to make a turn to the west as the northeast monsoon arrives this weekend and that a low-level ridge will build over southern China. As BANYAN reaches the South China Sea, it will pick up strength slowly in acceptable atmospheric environments. However, as the storm moves west it will encounter appreciably cooler water which will lead to its weakening. As BANYAN travels north, it may enhance the northeast monsoon that is expected to arrive near the weekend by increasing the pressure gradient. 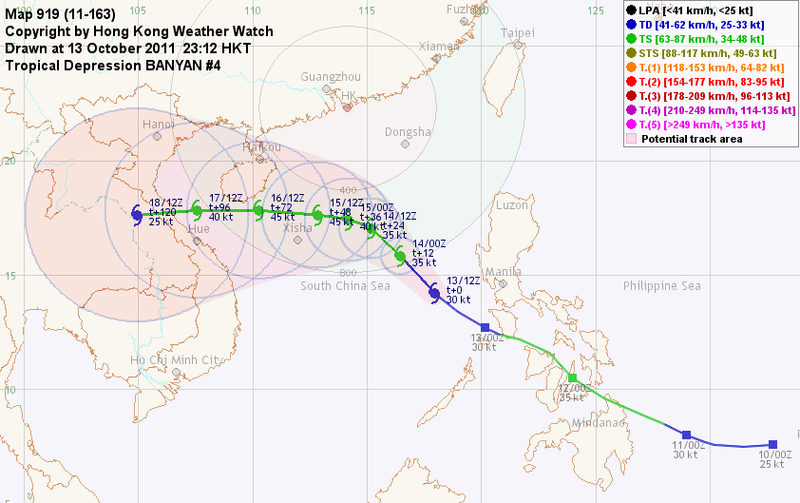 BANYAN is now traversing central Philippines. At 20 HKT, BANYAN was centred about 280 km (150 NM) SSE of Manila. BANYAN is travelling WNW in the south to southwestern periphery of the subtropical ridge. As the ridge reorientates BANYAN is expected to move NW in the next 36 hours. 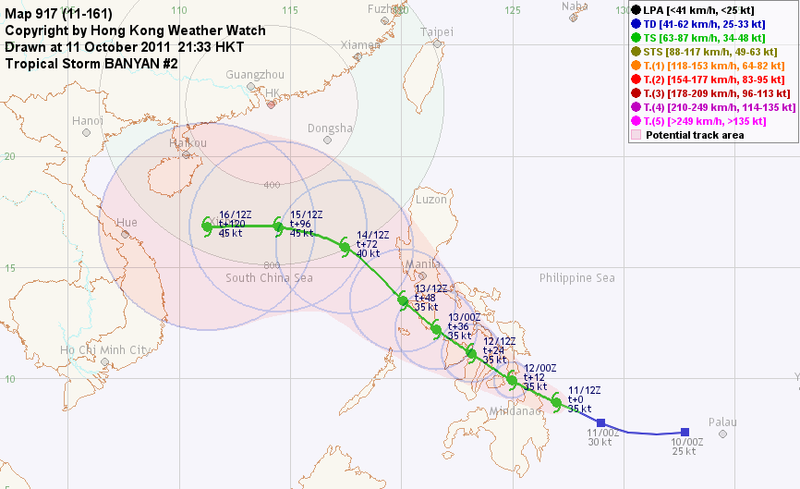 Models diverge on subsequent movement with some tracking the storm further north, some rendering the storm motionless while others push the storm westward due to an arriving northeast monsoon and the rebuilding of the ridge. The current bulletin still favours the final scenario. Due to land interaction and moderate to high shear, BANYAN has been struggling to intensify. BANYAN is expected to strengthen slightly after it enters the South China Sea, but strong intensification is not expected as conditions at South China Sea remain marginal. 23W has intensified into a tropical storm and was named BANYAN. At 20 HKT, BANYAN was centred about 910 km (490 NM) SE of Manila. BANYAN is expected to turn NW along the southwestern edge of the subtropical ridge that is expected to weaken soon. As BANYAN reaches higher latitudes, it will encounter a surge of northeast monsoon that may push it westward. BANYAN's spiraling structures have become more apparent, although the storm is still lacking organization. Intensification is expected to halt as BANYAN crosses the Philippine islands and travels in an area of elevated shear. Slight intensification is possible as it enters South China Sea, but sea temperatures at the western part of the Sea is way lower than the level necessary to sustain a tropical cyclone. An area of low pressure near Palau strengthened into tropical depression 23W today. 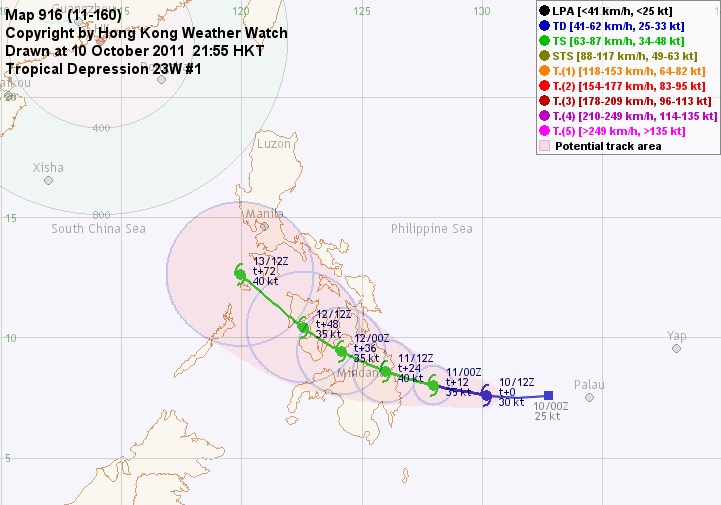 At 20 HKT, 23W was centred about 1270 km (690 NM) SE of Manila. 23W is moving W along the southern periphery of the subtropical ridge. A midlatitude trough is expected to weaken the ridge mid-week this week, allowing 23W to turn poleward gradually. 23W is developing in a region with rather high sea temperatures and low shear. It is expected to strengthen in the next 24 hours, but travelling across the Philippine islands will probably affect its development.